Potentially valuable drugs slowed down by sticky molecules may get another shot at success. 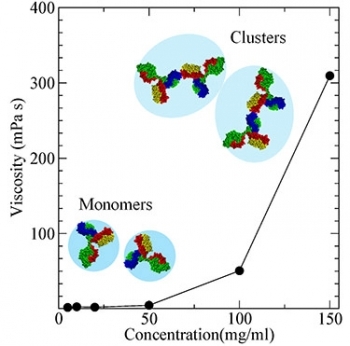 Joint research by the National Institute of Standards and Technology (NIST), Genentech, the University of Delaware and Institut Laue-Langevin (ILL) has revealed the reason why a certain class of proteins tends to form clusters that lead to high viscosity in drug solutions. The newly published results* could help drug companies create a variety of cancer and autoimmune disease treatments based on monoclonal antibodies, whose stickiness can make them difficult to administer through thin needles. Monoclonal antibodies (mAbs) are Y-shaped protein molecules that hold great promise for disease treatment. In principle, the tip region of two of their "arms" can be engineered to deliver attacks on tumor cells without harming surrounding tissue, making mAbs less dangerous to the body than standard chemotherapy, that kills both healthy and cancerous cells. However, a roadblock in the way of their bright pharmaceutical future as a subcutaneous injection—the preferred delivery technique—is their high viscosity: in solution, some mAbs become so viscous at required high concentrations that they are nearly impossible to inject.